The Rapidport/4 USB to four-port modem module with built-in USB hub is the next step in USB and remote access for Microsoft NT 4.0. This external, user-installable solution plugs into an existing USB port of a PC, thin client or server, providing four 56K V.90 modems. 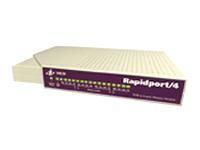 The Rapidport/4 gives network users access to ISP, fax, and other group dial-up applications supported by NT RAS.